You can have this translated into your preferred language by using our convenient translation facility located on the right-hand side of the page. 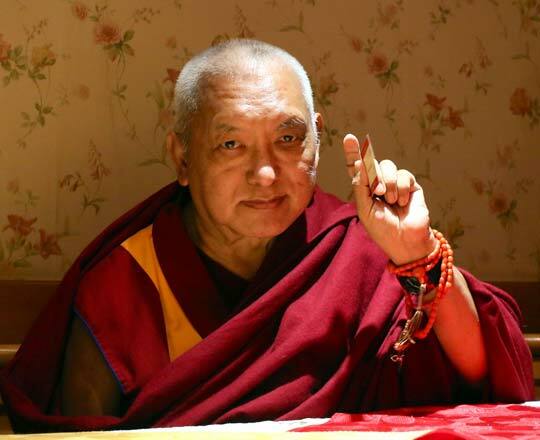 Lama Zopa Rinpoche sends his greetings! Mongolia, September 2013.
with our best wishes for peace, happiness and joyous compassion through 2014 and beyond. May all the holy wishes of His Holiness the Dalai Lama, Lama Thubten Yeshe and Lama Zopa Rinpoche be fulfilled perfectly without delay. The purpose of FPMT is to teach Dharma, to end the suffering of living beings. Next Foundation Service Seminar – Save the Date! Rejoice! Announcement from the Maitreya Project! Tsog offering to Lama Zopa Rinpoche during the official annual long life puja at Kopan Monastery, Nepal, December 9, 2013. 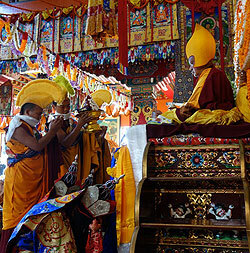 Please rejoice in the total practices done for Rinpoche’s health and long life, also offered during the long life puja! Rinpoche recently finished a brand new teaching and translation on the benefits of offering to stupas – Padmasambhava’s Instruction on Offerings to Stupas. It is quite an amazing, monumental work, which took Rinpoche more than two months to complete, and which Rinpoche would like to be used far and wide. The text details the benefits of circumambulating, and prostrating, making offerings, and offering service to stupas. The booklet is available in eBook, booklet letter, and A4 formats as well as in Italian. Holy objects, including stupas, are very important to Rinpoche and the FPMT for enabling students to create merit on their path to enlightenment. Building 100,000 stupas around the world is one of Rinpoche’s Vast Visions. Please enjoy the very inspiring collection of information and photos of the 48 stupas completed so far! You will find more advice from Rinpoche about holy objects on Rinpoche’s Advice page. Lama Zopa Rinpoche teaching on how important it is to serve others during the November course at Kopan Monastery, Nepal, December 1, 2013. May 4 – 18 Light of the Path retreat, Kadampa Center, USA: registration is now open! Lama Zopa Rinpoche playing the damaru with his right hand. 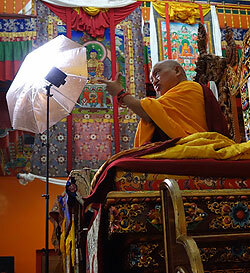 Rinpoche finds it a little difficult, but manages. Rinpoche’s right leg and arm continue to improve, Kopan, Nepal, December 2, 2013. 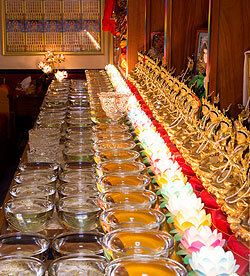 Some of the extensive offerings at Kachoe Dechen Ling, USA. FPMT International Office manages 18 wonderful charitable projects that support Lama Zopa Rinpoche’s Vast Visions for the FPMT organization. 2013 has been a truly outstanding year due to the sheer volume of support we were able to offer to these worthy and beneficial projects. We are very pleased to offer you the chance to rejoice in all of these activities regularly. Each charitable project has a regularly updated individual news blog and photo gallery which chronicle the project’s ongoing work and achievements and the many lives it enriches. You can check online to see the latest news and updates. You can also subscribe to get the latest news delivered to you by email. Thanks to all who made 2013 such a charitable year. Daily Meditation – In October we released the indispensable new practice from Lama Zopa Rinpoche, Daily Meditation. Since then, Rinpoche has kindly added two newly translated mantras and made some minor adjustments. It is available from the Foundation Store. If you purchased the earlier version of this practice, you can request the revised version by writing to shopfpmt@fpmt.org. Sutra on What is Most Precious to a Monk eBook – This sutra from the Vinaya discusses the meaning of and motivations for monastic engagement. FPMT Spanish Translation Services is launching their Basic Program Series. A new and inspiring Basic Program Online subject, The Tathagata Essence, is now available on the Online Learning Center. The course is audio based and includes guided meditations for a short retreat. Istituto Lama Tzong Khapa’s second Masters Program completed with a celebratory puja on November 24. Students who wish to graduate will start their one-year retreat soon. 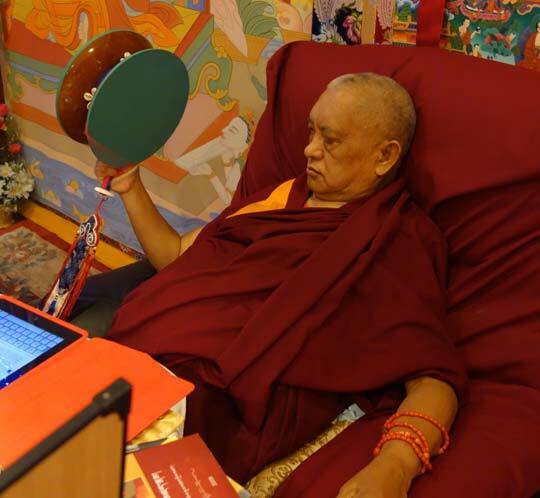 Thanks to all who sent photos – Mandala online features a collection of photos from various FPMT centers, projects, services and students around the world that have hung flags to support Lama Zopa Rinpoche’s health and long life. Mandala January-March 2014 has been mailed to Friends of FPMT and FPMT centers. 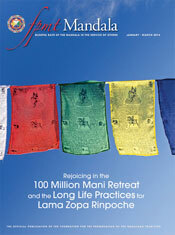 The new issue of the magazine features articles on the 100 Million Mani Retreat in Mongolia, the long life practices for Lama Zopa Rinpoche and the Foundation Service Seminar in London. As always, we offer inspiring stories of study, practice and devotion from the international FPMT community, which you can support through the Friends of FPMT program. By signing up now to become a Friend of FPMT at the Foundation Friends level or higher, we will mail you this issue of Mandala as well as send an email with a link to the electronic version, which you can read right away. For more, visit us online at fpmt.org/mandala. We are happy to announce that the next Foundation Service Seminar will be held at Institut Vajra Yogini, France, August 12-16, 2014. Please save the date! It’s time to start counting up your International Merit Box donations! Collection begins on Lama Tsongkhapa Day – December 27 – and goes until March 31, 2014. Click here to find out how to send in your donations. The Perfect Human Rebirth, the new book by Lama Zopa Rinpoche, is now available in the FPMT Foundation Store! This is the next in Lama Yeshe Wisdom Archive’s Lineage Series. For any center which has or is building a stupa, consider giving benefactors, students and supporters Lama Zopa Rinpoche’s newest stupa advice. Maitreya Project Trust is thrilled to announce that on December 13, 2013 Lama Zopa Rinpoche and the chief minister of Uttar Pradesh jointly officiated at the foundation stone laying ceremony on Maitreya Project land in Kushinagar, India. The ceremony signified the handing over of approximately 275 acres [111 hectares] of land which the state government provided to the Maitreya Project. For more than 12 years, the Maitreya Project has worked with the government of Uttar Pradesh in planning the construction of a magnificent statue of Maitreya, the future buddha, in this key Buddhist pilgrimage site. This ceremony was the culmination of tireless work by many people. 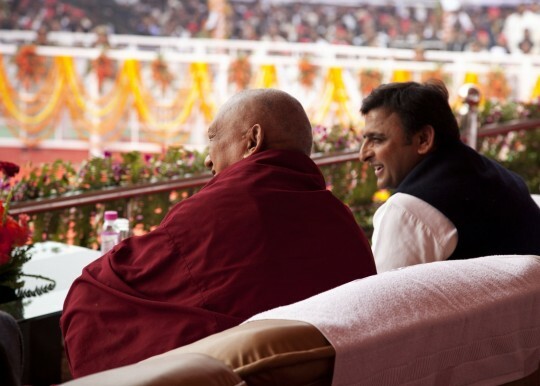 Lama Zopa Rinpoche and Chief Minister Akhilesh Yadav during the foundation stone laying ceremony, Kushinagar, India, December 13, 2013. The Foundation for Developing Compassion and Wisdom (based in the UK); Milarepa Center, USA and Atisha Centre, Australia have exciting director vacancies.